Your Guide to Gas Spring Design and Customization: Part I – ACE Controls Inc.
Standard, off-the-shelf gas springs are never in short supply. But ordering your gas spring from a catalog comes with risks. Depending on your application, some degree of customization is necessary to ensure you have the right one for your assembly. The next few blogs will provide a helpful overview of what you need to know about gas spring design and customization. We’ll explore the various gas spring types, selection data, proper mounting—and more. Let’s kick off the series with a look at standard versus engineered springs. While standard gas springs can be a quick and inexpensive purchase, a lot can go wrong during sizing and implementation. For one, off-the-shelf springs commonly offer one of three choices of output force. Will one of those forces be exactly right? Either way, you may get unintended results. If the factory-supplied output force doesn’t succeed, for example, your hood or lid may open unexpectedly. In addition, standard gas springs can come with the wrong end fittings. Situations like these can cause you to spend unnecessary time trying different forces or modifying your assembly—inflating your labor expenses and delaying your operation. 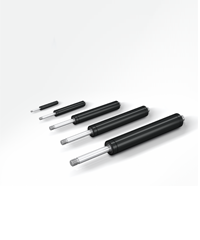 An engineered gas spring, on the other hand, refers to a premium custom part that is adjusted according to your unique specifications. The added investment pays off via the time and labor cost savings that result when your gas spring works to perfection. ACE Controls’ customer support combines online tools and knowledgeable engineering staff to assist you in making the necessary modifications to your standard gas spring—including recommending the correct end fittings to make installation easier. To learn more about designing and customizing gas springs, download our latest white paper. And stay tuned for more upcoming posts on this topic.